In this guide you’ll learn which tools you’re likely to need for a decking build; with some top retailers listed on our experts’ recommendations. Of course the complexity of your build will often dictate how many of which decking tools you’ll need, but any construction project will always require at least some tools to make the build easier. As with all DIY projects, some tools will be worth purchasing while others can be hired or borrowed. There are a number of tools used in the building of garden decking that can be used across a multitude of DIY projects around the home. Jigsaws, drills, hammers, orbital sanders – all have a variety of DIY applications. Only you will know by your individual circumstances and whether purchasing your tools will be worthwhile in the long-term; but homeowners who have plenty of work in the pipeline are generally advised to buy their tools. You only need to read this if your build is a DIY job. If you’ve hired a professional to get the job done, he or she should have their own tools – meaning you can skip this part! In fact you can skip the entire next section on building your deck & move onto decking aftercare. The foundation work is where you’ll lay your deck posts; in most cases, with concrete. For a basic deck with minimal requirements, you probably need no more than a shovel to help dig your holes. For more advanced builds, your time may be spent more economically by hiring an auger for the day (a large corkscrew tool to help drill holes in the ground). For the concrete, you will need a small mixer, a wheelbarrow & a shovel. This is likely to be cheaper than ordering premixed concrete for delivery. 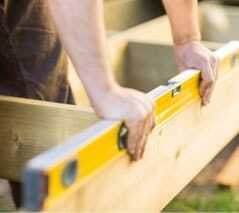 For the construction of your decking frame, you will need tools that help with the cutting & nailing of timber. You’ll also need a pencil, square & tape measure to help ensure you get your dimensions right. For cutting, you may be able to get by with a handheld saw – but a circular saw is well worth the investment & will save you a ton of time & effort! For nailing, most simple projects can utilise a handheld hammer – but it is worth making use of a pneumatic nail gun if you have access to one. These are less likely to split the wood during the build, but they do require a certain level of experience as they can be dangerous for beginners. Hiring one will save you plenty of time if your project is time-sensitive. When finishing your deck with your chosen type of boards, you’ll definitely need a drill. Most types of boards require pre-drilling to prevent them splitting so it’s a worthwhile investment. A jigsaw should be used to help cut your boards to their desired length. This can also be used to add precise curves to your deck if required. If you have chosen a softwood or hardwood structure, you might also benefit from an orbital sander. As you’ll need to sand your deck for maintenance & treatment every 2-3 years, this will likely be a worthy long-term investment. Not all of the tools listed below will be required for your build. In many cases, the use of an electric tool will negate the use of a manual one. For instance, the use of a jigsaw rather than a traditional handheld saw. Our list below is intended as a guide rather than definitive list of everything. Our experts have sourced the best online prices for most goods which you can find linked below. We aim to keep this as up-to-date as possible – please contact us if you have found a product at a cheaper price than we’ve listed it below. And remember: the cheapest tools are not necessarily those best suited to your build! In fact, in most cases they won’t be. As always the message is to shop around before you buy. Uses: In case of injury! As with the tools checklist, not all of the materials here will be required for your build; this will likely depend upon the complexity of your deck. You should thoroughly evaluate your needs against this materials checklist before sourcing your decking tools. Our calculator can help you to establish what materials you’ll need based on your deck’s measurements. A description of these parts is available in our decking terminology & anatomy guide.